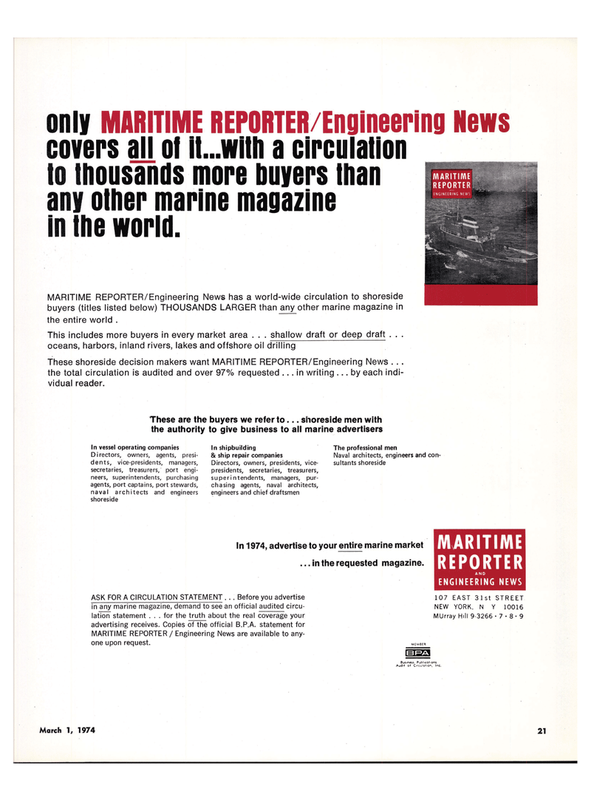 only MARITIME REPORTER/Engineering News covers an ol il...with a circulation to thousands more buyers than any other marine magazine in the world. MARITIME REPORTER/Engineering News has a world-wide circulation to shoreside buyers (titles listed below) THOUSANDS LARGER than any other marine magazine in the entire world . These shoreside decision makers want MARITIME REPORTER/Engineering News . . . the total circulation is audited and over 97% requested ... in writing ... by each indi- vidual reader. In 1974, advertise to your entire marine market ... in the requested magazine. MARITIME REPORTER / Engineering News are available to any- one upon request.